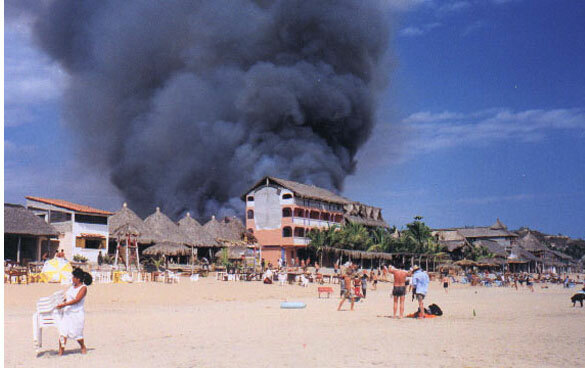 Zipolita'z y Angelita'z AdventureZ In Mexico: Zipolite 2001 Fire- Reminder to Take Care!! 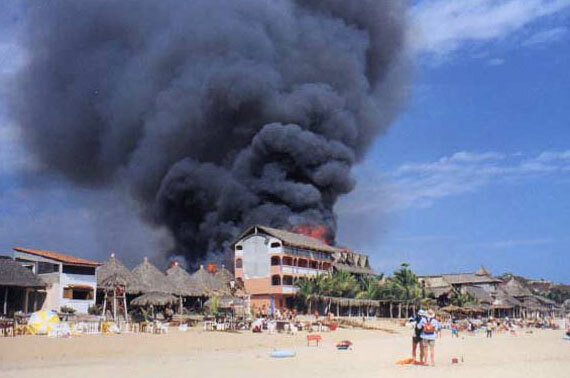 Zipolite 2001 Fire- Reminder to Take Care!! So why am I reposting this? It's because the other night someone let off fireworks. The first 2 big bangs scared the crap out of me. Then watching the fire works was pretty but it scared me as they looked so close to the palapas. So then I talked to a friend and we talked about it all. We realized many of the children here were not born. They do not remember it at all except for stories from their parents and others. My child was born from the ashes you may say. It's because of the fire, her father and I got together. We lost all our things but look at the miracle that happened. So this a reminder and warning to be careful. After the fire there were many rules. No fires on the beach. No cooking or candles in the palapas and others I don't know about ...because I left. So share this story and be careful okay. Take care of yourself and others. Get fire extinguishers and be so very careful with fire. Especially if it's windy. 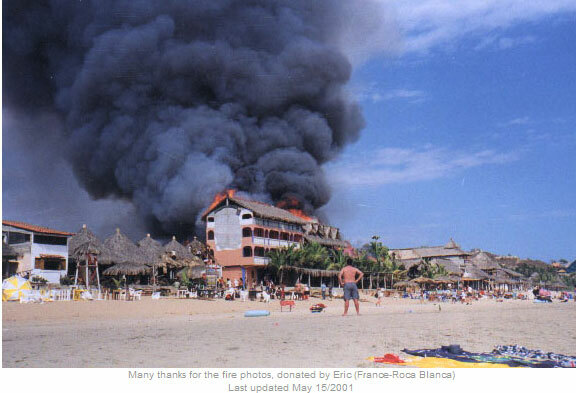 The wind that day pushed the fire straight back to 3 de Deciembre Restaurant. I thought the whole town would burn. It traumatized me and many others. So blessed there was no loss of life. It was during the day. If it had been at night could have been much worse. Okay. So read the story below and please take care and be careful. Sending love and light and putting us all in a bubble of love to keep us safe. Keep our beautiful Zipolite safe and never ever let this repeat. If we never forget we won't make the same mistakes. If we are prepared we can prevent tragedies like this. Gracias for listening. This is from 2012, but the fire happen Feb 2001. Feb 21/2001 Tragic Fire burns town!Fire! I was showing Margarita my braids, when a boy raced past, "el loco!" we teased.Then there was yelling in Spanish, I thought I heard "mort!" for a moment I thought someone was drowning, and the boy was racing for help. Fire!! Fire, someone yelled. There's a fire at the Tao. I raced to the back of Daniel's Brisa Marina, and looked up to see big red flames and thick black smoke coming from the top of the Tao. It was true! Oh my God, this whole place is going to go. I had just moved to the Lavendria and was so pleased with my new little home. 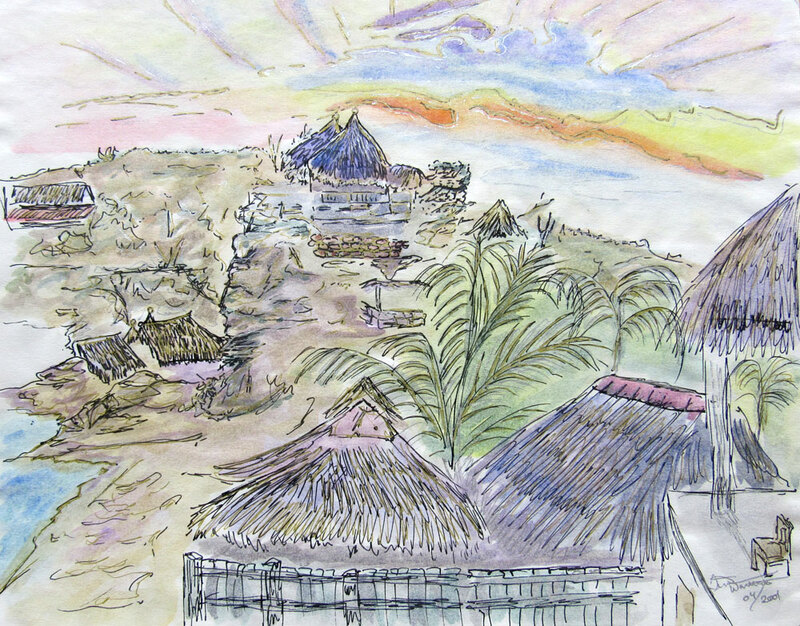 My little palapa was new with pink cement walls that went half way up and then wood continued to the new thatch roof. There was a nice bed with a mosquito net, desk and waste basket. 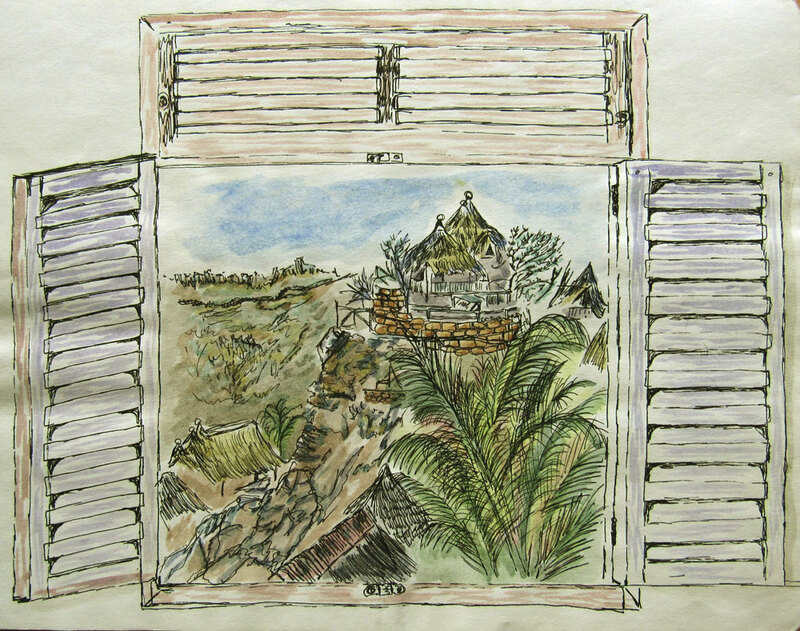 I had decorated it with calalilies,( $1US for a bunch), grass mats, and sarongs. It was very cosy. The bathrooms and showers were clean and the rent was only $800 pesos a month. Perfect being on the incredibly tight budget I was on. My stuff!!! my brain screamed at me. I raced to my room. The girl in the room next door was there. I yelled at her, get your stuff, "There's a Fire, the Tao is on fire, this whole place could go." I ran inside and started throwing things in. I knew I could never get it all in my packs, they had taken hours to squeeze everything in just right. I had to make decisions, any minute the thatch roof might catch and then I'd be trapped either in the room or the courtyard. I was freaking. Things were popping and crackling. I was sure there would be an explosion with so many cars, not to mention everyone in Mexico has gas, and big propane tanks. I grabbed what I could and ran out into the street, toward Peter Pan's the Bakery and the Ziponet e-mail place. What should I do?? 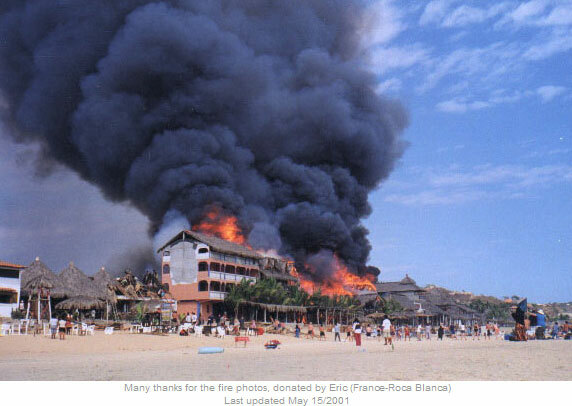 I had forgotten my shoes, one part of me yelled go back, go back, and the other just watched in horror as the flames engulfed the the palapa of the Tao, three floor hotel/restaurant. A huge cloud of black smoke rolled our way and the flames licked the sky. With my half-empty packs and my little suitcase (that carried a very old 486 laptop). I made my way towards the main road, thinking that I would get a room in Pochutla and come back tomorrow. My packs were light, because I had left a lot behind, but I just couldn't go back, now, it was too late. Oh, my God, what a nightmare. How could this be happening to my beautiful Zipolite? There was a girl in the cab; she had a baby with her. Sarah was her name. She said I could get a room at her friends at the end of the beach. I said "Thanks!" I was so grateful. So that's where I went. The fire burned and burned, I could watch it from the east end where I was. The fire was right in the middle of downtown. All the things that burned kept popping into my head. Now I have no lavender oil to protect against mosquitoes, I thought...and then I thought, how petty, when so many people lost everything. It's a disaster. It all went up. All the pretty sarongs, and grass mats, and the beautiful calalilies I bought in the market. The lavandria....All gone now. Ashes, ...Daniel's Brisa Marina, ashes...where I lazed in the hammock watching all the beautiful sunsets. It's all gone now. Everything..even the hammock.. I hung around the east end posada for a long time watching the fire from afar. The fire would slow and then grow again. Huge flames leaping into the sky. The People, the people I prayed, please God let everyone be o.k. My camera, I cried inside. Maybe it didn't burn, I prayed, but I knew. The fire raged off and on for a few hours, huge billowing black clouds, and flaming red fingers reached skyward and back towards the road. It looked as if it was just going to keep burning and burning. I was really nervous but then we realized there was a lagoon. There was a lot of space between where the fire could reach and my temporary new home. Someone arrived and said one by one, going through the people. is carbon paper in between each one. Incredible. Lupe, who I believe is Kiko's dad took me to see Solidad, who had a list, and was speaking with a man who could speak very good English. I explained about all the things I lost and about the $900.00 pesos ($90US) that I had paid in advance for my rent at the lavandria. I also told them all, that I build web pages, and was going to try and get some help for these people. The man told me that he was from the state and he was also trying to help these people. He asked me if he really thought the state should or would actually pay for the personal belongings that I lost. I said," no, not really", and then for some reason we all laughed and smiled...."but", I said, "what really want and need is that $90US that I paid in advance". Solidad and the man laughed and spoke in Spanish, and then he said, he had asked Solidad, if I knew that they only had the clothes on their backs and nothing else. The rent I paid was burned along with everything else. There had been no time to save anything. The man said that there were a lot of tourists that lost everything and that they were going to try and help these people. He said that I was to go to a meeting at two o'clock that afternoon at the San Cristobal restaurant. As I wandered about to pass the time, I entered what was once Daniel's Brisa Marina, now just a burned out shell. Nothing was left except the cement and rebar. My original little cement room, looked empty and the same but everything else was gone. It looked like a bomb went off. All black and charred. It was there that I ran into Francisco, who had had the little store between the Tao and the Pizza place. He asked if I was o.k and I told him of my experience and loses. Then he told me he lost everything, he had nothing but the shirt and pants he was wearing. I told him how sorry I was, and hugged him, hoping to add the tiniest bit of comfort. Francisco was always so sweet, everytime I visited the store, he always called me gaupa (waupa-pretty). It's so incredibly sad. All day was like that, as I wandered to and from my regular haunts, I would run into people telling me they only had what they were wearing. Everything, Todo (All) is gone. Nada, nothing left. I went up to Shambhala and spoke with people there. A man was telling about another fire that happened in November, but they stopped it. They couldn't do it this time though. He said they tried so hard, but they just couldn't. It was the wind. It was blowing so hard, it was just like a raging forest fire, leaping across the top of the cabanas, from one thatch roof to another, leaving a blazing trail in it's wake. L had been in the process of moving. His things were in the street. He had stopped to help a friend with something, and then the fire had started. He was helping with the fire, and then realized that all his things were in jeopardy, and by then it was too late. All his possessions burned. He also lost about $200US in pesos that he'd had hidden in a book. He was alive, and only had a small burn on his foot. We were both very lucky we agreed through our tears. We went together to the meeting to see if we could get some sort of help. I found the man at the meeting and he said to go back to where all the people were and to fill out a report. So we did, and we waited and waited. It it took hours. A bed, that had been salvaged was set up, and burned out tourists from the Tao were lying on it. They had lost everything, passports, money,everything, they only had the clothes they had on..
Juanito and Tomasita and children-lost everything-they are rebuilding, but it will cost a lot and the government is only helping with a small amount of cash and a line of credit. They have already rebuilt a few buildings. Stay tuned as I tell you wonderful stories of this family and their strength. 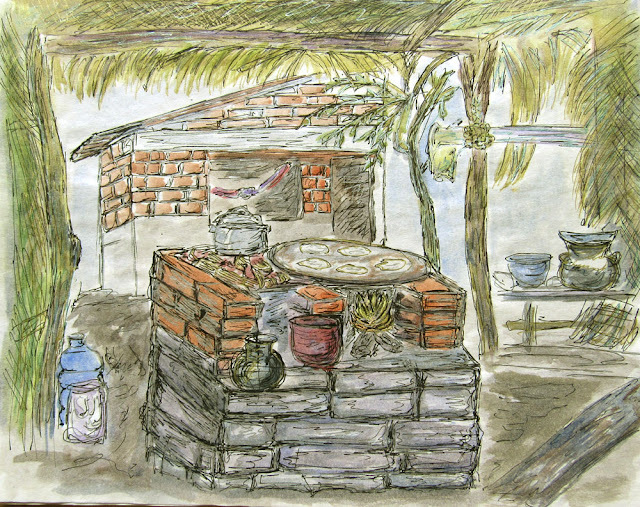 Tina Winterlik(me)(Canada),-cabana tenant- What I lost in the fire. I had no insurance. Nikon zoom espio 928 camera, tripod & film, photographs, essential oils, tape recorder, tapes, clothes, hat etc. On the bright side, since my camera burned, I needed an outlet for my artistic energy. 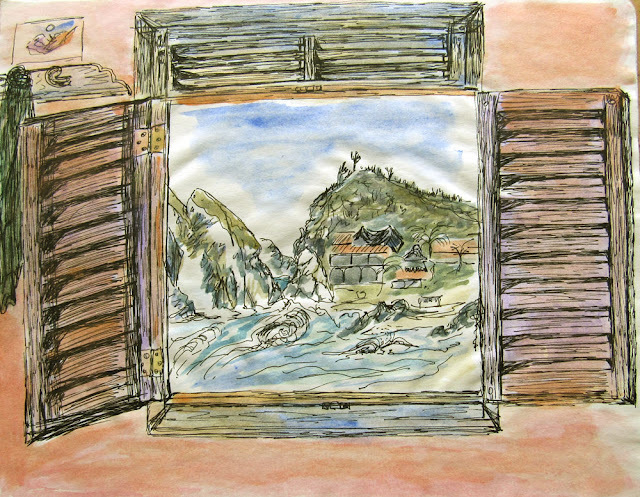 I started to paint-watercolours. Many people really encouraged me, and I hope that I will be able to show you my paintings soon. I am going to make them into cards and both cards and original paintings will be available for sale. 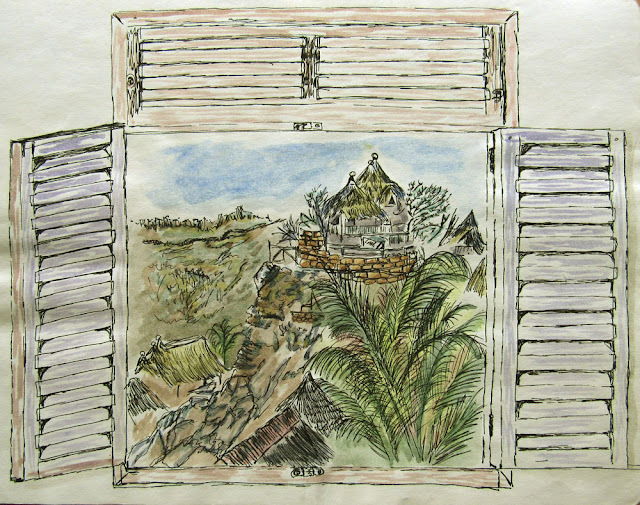 I painted over 50 paintings after the fire.